When HiKu Productions, producer of Variety British Columbia’s live eight-hour Show of Hearts Telethon, was developing a new set design for the telethon, they turned to Loungeworks, Transformit’s partner in Vancouver, to help realize their vision. The initial set design concept was developed by HiKu Productions and Global BC art director Cyril Meusy. HiKu worked closely with Transformit’s partner in Vancouver, Tom Stulberg of Loungeworks, to select Transformit pieces that fit the concept — several Crescents, an Ice Floe, and a custom wing with a framed arch opening. From there, HiKu worked with set and staging manager Larry Van de Keere and lighting designer Jeremy Dahl to position the Transformit pieces within the theater at Hard Rock Vancouver and develop lighting palettes and effects that worked nicely with the fabric structures. The Creative Services department at Global BC built upon the Variety graphics look to create the artwork, which Sean Nieuwenhuis of Sensory Overload rendered for projection. “The result was a fresh look that dazzled the audience, wowed viewers and helped to raise funds for Variety BC,” remarked Hinde. The compelling set and show more than captured the attention of viewers. 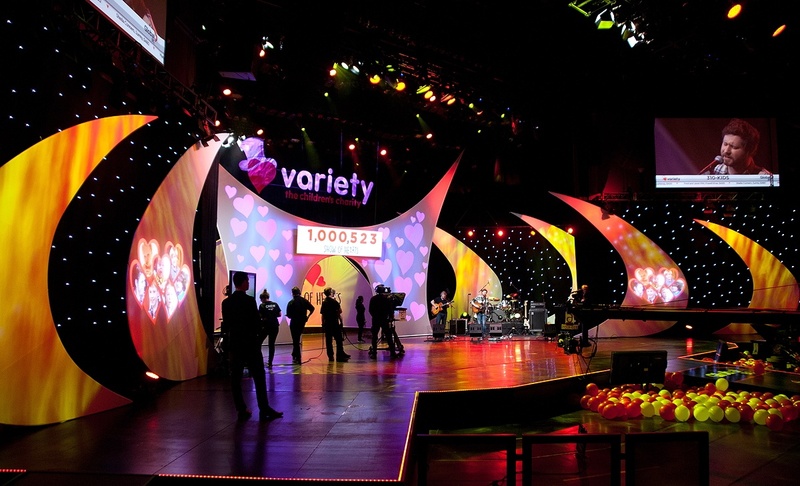 This year, the 51st annual Show of Hearts Telethon, raised nearly $5.1 million dollars for Variety BC – The Children’s Charity to benefit families who have children with special needs. Congratulations to HiKu Productions, Variety BC, and all their partners for a successful event.